The 20 new sites are finished. They are long, wide, flat, concrete, pull-thru sites with full hookups. Still $20 a night. THEY DO TAKE RESERVATIONS NOW for the new sites. The hookups are conventionally placed and still shiny new. Driving instructions are still good. Check-in is at the old section and the new section is down the road (next right turn). The new section has its own bathhouse and laundry. The office/clubhouse in the old section is walking distance down a back driveway. This is a lovely quiet park in a secluded part of the base. Lots of tall trees around the park and deer who walk up onto the lawn. Had no trouble getting satellite DISH TV coverage. Verizon cell is pretty good. Park WIFI is weak. It is a 5+ mile drive around the flight line and down narrow tree-lined streets to the commissary and BX, but the BX and commissary are nice and well stocked. There is an asphalt perimeter path that winds all around this part of the base; great for walking and bicycle riding. 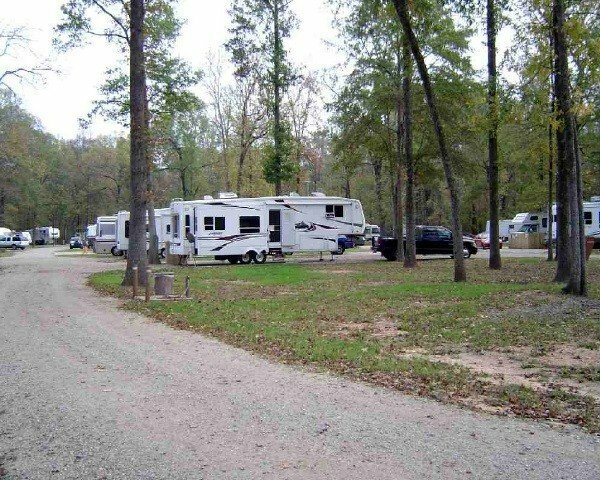 There is a nearby park for children (walking distance) and lakes for fishing and hunting on base within a few miles of the park. The map of base given out at the office is really horrible, hard to read, a partial map, with an inscrutable legend, and not oriented to the compass. Manager says new brochure and map will soon be available. Outstanding facility and staff (Thanks Theresa). Restrooms clean and heated. Computer available in office. FamCamp has everything except cable.... but local channels are available via air/antenna. Close to good stuff in Bossier City/Shreveport including casinos. Nothing negative to say. Enter via commercial gate off I-20 exit 23. Will definitely stay there again. Pros: Very nice, clean park and clubhouse. Staff was friendly and helpful. Fellow campers were helpful and friendly as well, and the park is very quiet (except for the cicada bugs at night, which is the loudest I've ever heard! Would be nice to have cable TV, as the satellite signal gets blocked by the thick tall trees (the same trees that provide excellent shade). I stayed here as a temporary home while house hunting, and it is has been very nice. Theresa and Paul are awesome, and the rates are the best by far in the entire area! We inadvertently went into the wrong gate but did not have to turn around which was nice. We finally found the campground after making a wrong turn but once there we were greeted nicely and were given a convenient campsite. Used the shower and got ice from the laundry room...everything was fine. Great place to stay,,, the staff was very helpful and the facilities were great. Comfortable shady spot, and nice quiet neighbors. 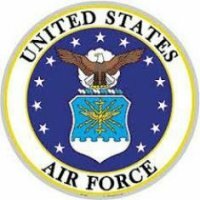 Easy and continent to get on and off base, great Bx and Commissary. The hot summer drought season is over at Barksdale. Oct 19 brought the cold spell and hopefully rain. It was good to see Theresa & Paul again. Same great staff and facilities. Everything's working as advertised and we got the last spot available. Yeah, some of the longer term residents here are getting a bit "junkie". I wish the time limits were tighter but then if & when I needed to stay longer, I might wish they were not. All we can do is keep our place spotless and hopefully it will rub off on others. I for one enjoy being a bit away from the main base. Close `enuff to get there easy but far away from the traffic. Check in was a breeze and received a nice site. Real value for the cost of $16.00. Site is level with good utilities. Beverly was extremely helpful explaining everything we needed to know at check in as this was our first visit to Barksdale. Hope they keep up the good work. The directions are spot on. Very friendly staff. Went out of their way to take care of us. Nice shady spots. Everything we needed so am going to stay one more day. Update to the camp trailers for rent, they don't have them anymore. They do still have the mobile homes though. My husband and I was up there on the weekend of the 22nd of April 2011.We enjoyed our stay and was very pleased to see how clean and well organized this campsite was run. The hosts were very helpful ...especially Adam & Beverly Handy who were extremely courteous and informative of the surroundings activities around the campsite. I give high marks to this campsite for quietness and overall camping experience, planning to make as many trips back to this facility as soon as possible !!!!!!!!!!! Spending a lovely evening among the tall trees. Just to add my admiration of the staff and facilities here. Plus the kids got a real kick when the B52 flew right over the camp. Hope they don't get an early start in the morning, I was hoping to sleep in. We are just here for the night, but wouldn't mind coming back for a longer stay. Back to Barksdale. 1st visit of 2011. From the last visit, the big difference I see is open spaces. 7 open today for example. The construction & placement of the 6 new FEMA double-wides is completed and FamCamp boss Teresa says it's allowed her to take out several MWR rental Travel trailers that were taking up regular Famcamp pads. So now there's more room in the Famcamp. Guess the FEMA trailers did some good after all. Same great park, facilities and staff. Lots of new building & renovations going on here at Barksdale, thnx to Global Strike Cmd, I guess. Still no diesel, however. We found this to be a very well run facility. Was a little hesitant about not being able to make reservations but had no trouble getting a site once we arrived. The sites are large and spaced well apart. It was very hot and dry while we were there. There did appear to be a fair amount of long term individuals staying at this facility. The free ice was an unexpected plus. Nice place to stop and stay for a few days. Hadn't seen a B-52 since 1968. They fly regular here. Played golf at the base's golf course. Caught it at the wrong time. They had just aerified and sanded the greens a week before, but that's life. It's a necessary thing to to. The campgrounds were clean, sites were roomy though it seemed like a few people had been there for some time. Campers were parked there and not a sole in them for my 3 day stay. Restrooms were very clean. FAMCAMP people were very helpful. I'll stop by anytime I'm passing through for a day or 4. After all, there are casinos in town. Over all, a nice place. Very nice quite wooded area, easy directions. Nice clean sites. Will stay here any time in the area. Have a 45 ft. rig, was assigned site #35 which was perfect. Staff was outstanding, very friendly & helpful. This has to be the greatest RV facility we have been to in a long while. The place is quiet, clean and hosts are really friendly and helpful. The base itself is really good, nice size Bx and Commissary and easy to get around. Today we are going to look at houses as we think this area might be a great place to move to. We're back at Barksdale prior to beginning our Fall/Winter RV travels. Barksdale Famcamp seems nicer than ever. The "tree men" have been here for the past 3 days removing the dead trees that a previous reviewer mentioned. It enabled us to watch the nearly full moon come up last night over the Famcamp. Four or five FEMA 3 bedroom trailers are now avail for rent @ $49 per night. They don't seem to bother the Famcamp or add to the traffic. The club/bathhouse is still great, ice maker still turns out tons of free ice. The wi-fi seems stronger than last visit and they have a new color Fampcamp brochure/map. Hurrah for BAFB MWR management.